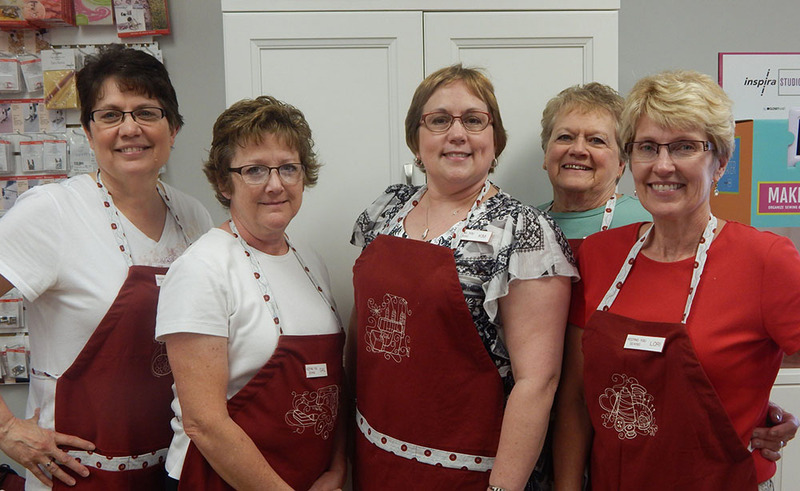 Keeping you sewing specialists, pictured above from left to right: Linda, Gail, Kim, Carol and Lori. Keeping You Sewing is a full service sewing center featuring Husqvarna Viking sewing machines. We also carry fabrics for quilting and garment sewing, patterns, notions, cutting tools, embroidery supplies, and more to meet your creative sewing needs. Owner Kim Rentz is a lifetime sewer with over 20 years of Husqvarna Viking sewing machine experience, including sales, service, and instruction. Her friendly, knowledgeable staff can answer any of your sewing questions. Most sewing machine models can be repaired here at Keeping You Sewing; Kim knows these machines inside and out. Kim and her staff really enjoy teaching others how to get the most from their sewing experience. When you visit Keeping You Sewing you will find a friendly store atmosphere where you will enjoy ongoing support, creative inspiration, and fun, educational classes, no matter your skill level. Come see how Kim and the staff can keep you sewing today! Downtown, across from US Bank with ample parking behind the building! Please feel free to contact us with any questions regarding our products or services!